Sun Records, located at 706 Union Ave., was a record label based in Memphis, Tennessee starting operations on March 27 1952. 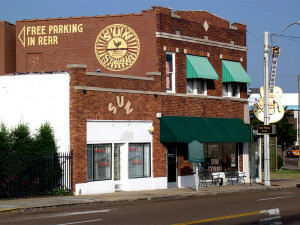 Founded by Sam Phillips, Sun Records was known for giving notable musicians such as Elvis Presley (whose recording contract was sold by Sun Records to RCA Victor Records for $35,000 in 1956 to relieve financial difficulties they were going through), Carl Perkins, Roy Orbison, and Johnny Cash their first recording contracts and helping to launch their careers. Pictured right: Sun Studio Memphis – image used under the Creative Commons 3.0 license. Before those days Sun Records had mainly been noted for recording African-American artists, as Phillips loved Rhythm and Blues and wanted to get black music recorded for a white audience. It was Sun record producer and engineer, Jack Clement, who discovered and recorded Jerry Lee Lewis, while owner Sam Phillips was away on a trip to Florida. The original Sun Records logo was designed by John Gale Parker, Jr., a resident of Memphis and high school classmate of Phillips. 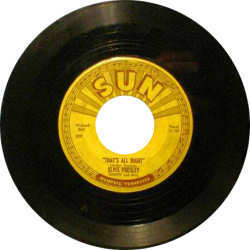 Pictured left: Elvis Presley ‘That’s All Right’ record on the Sun label. The music of many Sun Records musicians helped lay part of the foundation of late 20th century popular music and rock and roll, plus it influenced many younger musicians, particularly the Beatles. In 2001, Paul McCartney appeared on a tribute compilation album titled Good Rockin’ Tonight: The Legacy Of Sun Records. In 1969, Mercury Records label producer Shelby Singleton; noted for producing the Ray Stevens’ hit “Ahab The Arab” in 1962, and later Jeannie C. Riley’s 1968 hit single “Harper Valley PTA” on his Nashville based Plantation Records label; purchased the Sun label from Phillips. Singleton merged his operations into Sun International Corporation, which re-released and re-packaged compilations of Sun’s early artists in the early 1970s. It would later introduce rockabilly tribute singer Jimmy Ellis in 1980 as Orion taking on the persona of Elvis Presley. 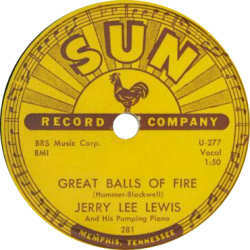 Pictured: Jerry Lewis Great Balls of Fire Sun Label. The company remains in business today as Sun Entertainment Corporation, which currently licenses its brand and classic hit recordings (many of which have appeared in CD boxed sets and other compilations) to independent reissue labels. Sun Entertainment also includes SSS International Records, Plantation Records, Amazon Records, Red Bird Records, Blue Cat Records among other labels the company acquired over the years. Its website sells collectible items as well as compact discs bearing the original 1950s Sun logo.